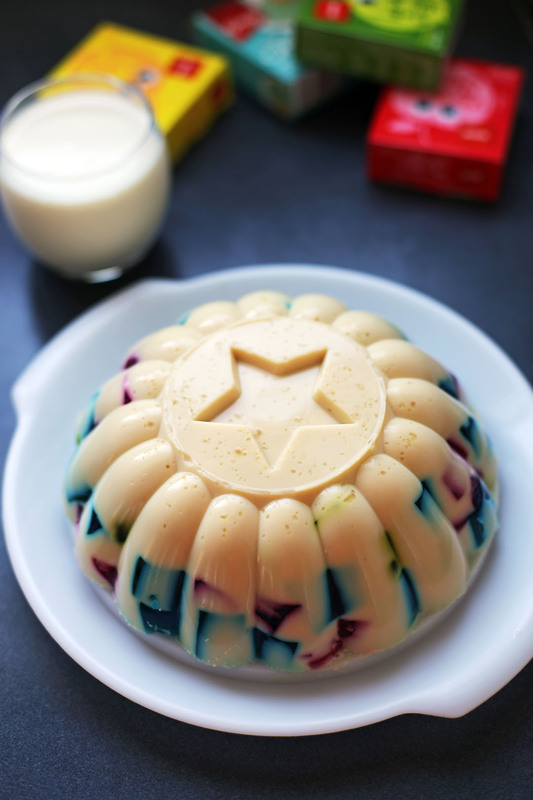 Cathedral Jelly or Cathedral Windows is a Filipino dessert made famous by Goldilock’s Bakeshop, it is a simple mixture of different coloured jelly squares inside a creamy gelatine mixture. I guess you know by now why is it named like such just from looking at the picture above. For a bit of information about gelatine, did you know that before gelatine became a commercial product there was a gelatine dessert already which is called “calf’s foot jelly” and from the name itself it involves extracting and purifying gelatine from the foot of a calf. Now having the purified extract this then is mixed with fruit juice to give it a more pleasant taste. But now there are a lot of gelatine substitutes like Agar and Carrageenan which is made out of seaweeds and its common to a lot of Asian desserts, there are also plant derived ones like Konjac and pectin. The difference from plant and animal derived variants is that plant variants tend to be more solid even at high temperature but they also dissolve only on high temperatures. I haven’t tried this recipe for some time now and I really don’t know the ingredients by heart, so I had a look on some recipes on the net but it all looks too sweet for me and there’s not a lot of recipes of this dessert out there (I found only 3 variations, others are just copy and paste) so I had to resort to remembering how my mom does it which I guess I am successful, so I give you this recipe. Try it out especially if you have kids they will definitely enjoy the different colours of this fruity and creamy dessert. Prepare each gelatine pack according to package instructions. Once set cut them into small squares then set aside. In a mixing bowl, combine boiling water, cater sugar and unflavoured gelatine together, mix thoroughly and make sure everything is dissolved. Add evaporated milk and cream then mix. Using a mould add all of the cubed gelatine then pour in the cream mixture, give it a mild mix so the gelatine cubes won’t stick together then place in refrigerator until it's set. I love the vibrant colours in this! It’s so pretty. While i know that there are many gelatine substitutes there, i had no idea what they were made of. Thanks for the mini intro! So lovely Raymund with all the colors inside. Wow i never had tried those yet, looks like interesting variant for adults to enjoy! 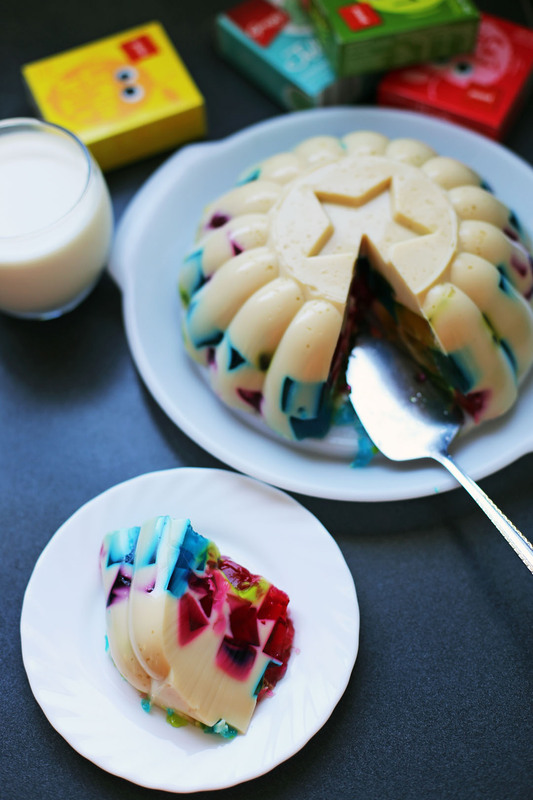 I see similar gelatin desserts here in Mexico, but I don’t know what it is called here — I will have to ask. Such a colorful dessert for a hot day. It looks like confetti! What a cool dessert, I’ve never heard of this, but I want to try it! I know gelatin as a whole as come a long way, but I never new there was such a thing as creamy gelatin mixture. I am intrigued by this recipe. I seriously always learn something here. Your “Cathedral Jelly” recipe took me down memory lane when my mother prepared a similar dessert for us and added whipped cream on top. It is such a festive looking dessert and rather simple to prepare. Thank you for the post and the great photo. I also remember some mini chicken drumsticks that she made – maybe you know what I am talking about – It was like a chicken lollipop – all the meat was cleaned off the bone and there was like a ball of meat on the top…. Any ideas? For that chicken lollipop we use small sized chicken legs but meat is scraped of from the non meaty side then pushed up, then the rest is similar to the southern style fried chicken. Hope this helps. What a fun idea! I’m sure kids would be all over that! is it ok to use all purpose cream in this recipe? Yeah, i will make window cathedral tomorrow can’t wait. Thanks for the recipe. Good luck to me. !